Occlusal splints or sutures are temporary compensations that are made of specific plastic masses of different thicknesses of shape and hardness. They can cover partially or whole tooth surfaces depending on the indication they serve and after the therapy is thrown, a new one is thrown or made. Retention splints < /strong> after a certain movement in the tooth movement, the retention splints are made to strengthen and maintain the position of the teeth, or to move their teeth in a particular position. 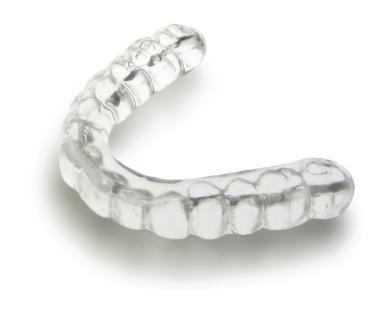 Nightguards for bruxism are made in cases in patients who have a problem with compression and creaking of teeth expressed most often unconscious during sleep. Their role is to reduce pressure and abrasion on teeth. Sportsstars or mouthguards are used most often as guards that will mitigate shocks and injuries in contact sports they cover entire tooth surfaces and partial gum surface to have as large a surface as possible. They are made of a specific type of rubber-resistant bending-resistant material that serves to amortize shocks and keep teeth in one whole. Teeth whitening so-called. Whitening foils cover entire tooth surfaces from the front or (vestibular) surface of the tooth containing miniature spaces into which the patient enters the bleaching acid. This way of whitening is called home bleaching as the patient controls how much to brush his teeth.